Turn an ordinary event into an extraordinary gourmet feast. 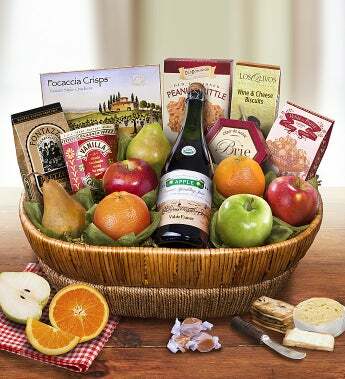 This beautiful woven willow basket is overflowing with a selection of pears, navel oranges, a juicy pineapple and seasonal apples, hand-picked and hand-packed from the experts at The Fruit Tree™. Dive into a selection of gourmet cheeses that include Fiscalini® Cheddar wedge and a Brie Creamy Cheese Spread. Snack on sweets that include Old Dominio®n Peanut Brittle and Fontazzi Butter Toffee Pretzels. Simply divine.